On the plains of West Texas, new wind farms can be built for just $22 per megawatt-hour. In the Arizona and Nevada deserts, solar projects are less than $40 per megawatt-hour. Compare those figures with the U.S. average lifetime cost of $52 for natural gas plants and about $65 for coal. Environmental rules and government subsidies are no longer the key drivers for clean power — economics are. Companies including NextEra Energy, Duke Energy and others that invest billions in power plants are already moving forward with long-term plans to generate electricity with cleaner and more economic alternatives. “We said before the election that whoever is elected president, we would be continuing our efforts to go to a low-carbon fleet and also pursue renewables,” says Tom Williams, a spokesman for Duke, the second-largest U.S. utility owner. 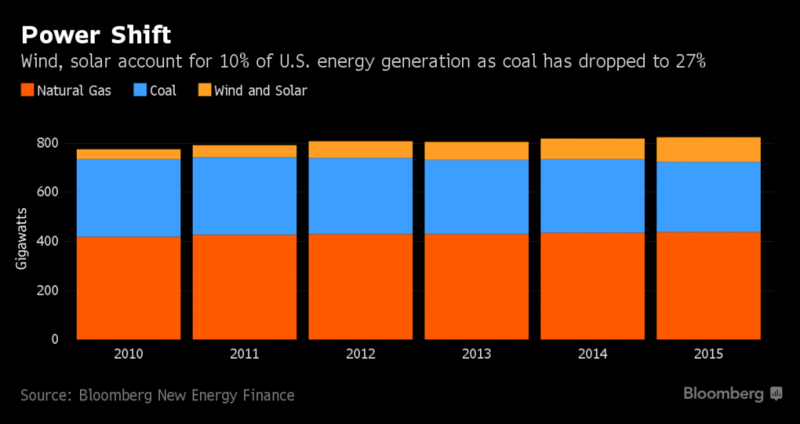 Wind and solar have been the two biggest sources of electricity added to U.S. grids since 2014 as utilities closed a record number of aging coal-fired generators. Trump has derided clean energy and assailed environmental regulations that hinder jobs, while pledging to revive the mining industry. In an interview Tuesday, Trump softened his view, telling the New York Times that he has an ‘‘open mind’’ on the Paris climate accord and noting that “there is some connectivity” between human activity and climate change. And it’s not just cost that makes clean energy attractive to utilities — it’s time. A solar farm can go up in months to meet incremental increases in utility demand; it takes years to permit, finance and build the giant boilers and exhaust systems that make up a coal plant, and they can last for a generation. A four-year presidential term is hardly a tick in that energy clock, and companies are already planning projects that will commence after Trump leaves office, even if he serves two terms. Over the next four years, utilities have announced plans to close 12 gigawatts worth of coal plants, largely because cheap natural gas has made them uneconomical — the equivalent of switching off a dozen nuclear reactors. Trump will have some levers at his disposal to influence how they’ll be replaced. He has vowed, for instance, to kill President Barack Obama’s Clean Power Plan, which would require states to reduce emissions from power plants. And two federal subsidies — the investment tax credit and the production tax credit — remain key components to making solar and wind affordable. He hasn’t indicated whether he’ll push to repeal the tax credits for wind and solar, which were extended for five years at the end of 2015 with bipartisan support. And the Clean Power Plan, which has been suspended pending a U.S. Supreme Court ruling, isn’t scheduled to take effect until 2022. Utilities, meanwhile, are marching ahead. “We are moving forward with plans that call for replacing some of our coal generation with natural gas, low-cost wind energy and expanding solar options for customers,” says Frank Prager, vice president of policy and federal affairs for Xcel Energy, which owns utilities in eight states. 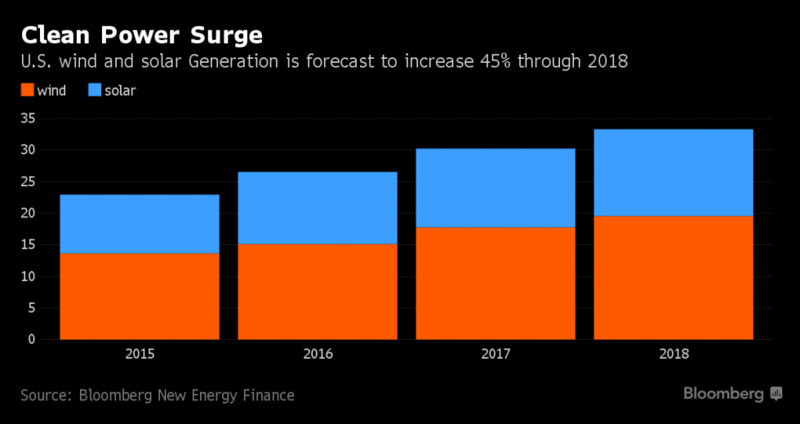 Even without the Clean Power Plan, Bloomberg New Energy Finance forecasts that wind and solar energy will grow 33 percent over the next two years, adding 40 gigawatts. A lot of that will be driven by state, rather than federal, policies. More than half of U.S. states require utilities to incorporate renewable energy into their generation mix, including the traditionally Republican strongholds of Texas, Arizona and Montana. California and New York have set goals to source half of their power from clean energy by 2030. Even if renewable energy loses support from the West Wing, it remains popular in corner offices across America. Electricity-hungry tech giants including Google, Amazon and others have increasingly sourced energy in recent years directly from wind and solar farms, signing at least 20 power-purchase agreements totaling 2.3 gigawatts in 2015 alone. Over the next nine years, companies have pledged to buy another 17.4 gigawatts, according to New Energy Finance. There are indirect ways Trump may impede clean energy. His proposal to cut corporate tax rates could blunt the effectiveness of the tax credits for wind and solar. He could cut research-and-development funding. Rolling back environmental regulations may make coal more competitive. And Trump will have the opportunity to appoint at least two members to the Federal Energy Regulatory Commission. Utilities aren’t waiting to see how it pans out.